All of them (hangs head in shame). Wait, we’re supposed to be just ONE? @Jenny: 🙂 What Types of Procrastinator Are You? I am 100% the Sidetracker + Perpetuator + Panicker. Sidetracking is pretty much self-care for Panicking. @Jenny, if you click through to the original comic, you’ll see that the artist claimed to be all of them. 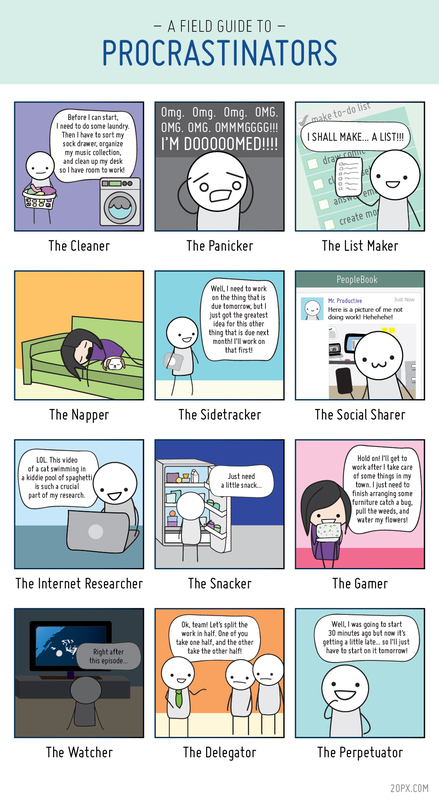 I only use about 6 of the 12: cleaner, list maker, napper, side tracker, internet researcher, snacker, and perpetuator. Hmm, it’s about time for lunch isn’t it? Then there’s that talk I was thinking of going to, and then the one at 3pm. Maybe after that I’ll go home and have a nap.